Ahead of the World TB Day which will be commemorated globally on Thursday the African Union and the Republic of South Africa marked the TB day Tuesday under the theme ‘Unite to end TB in Africa by 2030”. While significant progress was made in achieving the MDG target of halting and reversing the number of new TB cases by 2015, Tuberculosis has overtaken HIV as the biggest infectious killer globally, causing 1.5 million deaths every year. 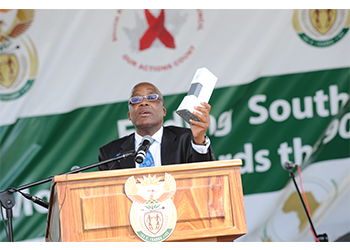 “Together with our social partners and development agencies, we will continue to remind our people that TB can be detected, treated and cured. We encourage people to get screened for TB. If infected with TB, people need to go on treatment as soon as possible and ensure that they complete their treatment” said Honourable Cyril Ramaphosa, the Deputy President of the Republic of South Africa. South Africa ranks 6th among the 22 high burden countries that collectively contribute approximately 80% of the total global burden of all TB cases. Based on its investment case for TB, the South African government allocated a further R240 million to the fight against TB in the 2017/18 financial year, which will increase to R500 million in the 2018/19 financial year making it one of the globally with huge investments in health. In 2014 Africa had 28% of the world’s cases, but the most severe burden relative to population. The number of new cases have fallen at an average rate of 1.5% per year since 2000. While the increasing trend of new TB cases has been halted there is a need to setting more bolder targets and increasing investments in TB if the disease is to be put under control. “The African Union is setting bold targets as outlined in the implementation plan of the African Union Catalytic Framework to end AIDS, TB and Malaria by 2030 that is being finalised for consideration by African Ministers of Health and subsequently for endorsement by the Assembly of Heads of State and Government” said His Excellency, Dr. Mustapha Sidiki Kaloko, the Commissioner for Social Affairs at the African Union Commission. Africa still need to ensure that all key populations affected by TB are reached. These include children and women, people living with HIV, people with diabetes, refugees, miners and ex-miners, drug users, prisoners, homeless people, individuals living in densely populated communities and whose access to basic health care services may be limited. One TB patient can infect 15 to 20 people. Drug resistant TB continues to pose a serious threat to progress achieved so far and can reverse the gains made. Improving detection, finding innovative ways of reducing the prohibitive cost of treatment and lack of adequate diagnostic capacity for detection remain critical. To address all these challenges Africa will need to step up efforts to mobilise resources. Africa had by far the largest funding gap of US$ 0.4 billion in 2015, equivalent to half of the global total. Increased domestic allocation of resources to TB and health systems strengthening is thus a key priority of many African Governments. With Africa being a major recipient of the Global Fund to Fight AIDS, TB and Malaria, African countries are expected to support next replenishment cycle this year in the context of many competing global priorities. Without a clear investment plan and if the world continues with business as usual TB is unlikely to be eliminated until the end of the 22nd century, and the world will miss the recently announced Sustainable Development Goal to end TB by 2030. The total investment required between 2016 and 2020 is estimated at US$ 56 billion. To achieve the set ambitious targets bolder policies and supportive systems including translating political commitments into action with adequate resources for tuberculosis care and prevention are required. Engagement of communities, civil society organisations, public and private care providers remain critical. More supportive universal health coverage policy, regulatory frameworks for case notification, vital registration; quality and rational use of medicines and infection control should be enhanced by all countries. In addition social protection, poverty alleviation and actions and sustained advocacy for free diagnosis and treatment of TB cases should be sustained. The achievements recorded though fragile have been the result of the hard work of African communities, governments, health care providers, civil society, the private sector and development partners all over the world. The resources committed by domestic and external sources have been fundamental to the progress achieved so far. This year the commemorations took place in Lephalale in Limpopo Province of the Republic of South Africa.